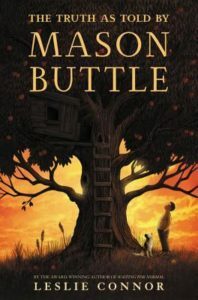 Mason Buttle lives in the crumbledown, a falling apart home in a large apple orchard. He can barely read or write, and has more than his share of bullies. When his best friend, Benny Kilmartin, dies, Lieutenant Baird gives Mason a pencil and a notebook to write down exactly what happened. Mason doesn’t understand why no one believes him. When Calvin Chumsky arrives, Mason finally has a new best friend. Little do they know their adventures will lead to more tragedy, and answer a few mysteries of what really happened to Benny. I was very invested emotionally in this story, as it mirrored someone in my own life. Very well written, with a surprising twist. This would make a great read aloud. Thanks for the review Terrie, It sounds like a great book. I love stories about kids in real life situations and how they deal with them. Your review of this book reminded me of the book “Okay for Now” by Gary Schmidt. which is a companion to “Wednesday Wars” by the same author.